I’m not at development camp this week, so here are some links to stories penned by those who are in attendance. It sounds like Danton Heinen and Ryan Donato plus Ryan Fitzgerald impressed up front during the first day’s on-ice session, while Charlie McAvoy and Jeremy Lauzon were standouts on defense. Daniel Vladar’s physical tools make him tough to beat in the net- neither Malcolm Subban nor Zane McIntyre were a part of the session after doing earlier on-ice work with Boston coaches. 2nd-rounder Ryan Lindgren was not present Tuesday due to a summer school requirement but will be in Wilmington with the prospects today and for the remainder of the four-day program. Just to reiterate- Rob O’Gara is not at development camp because the Bruins did not require him to be there. It would have been his sixth, and apparently- he is far enough along in his progression that his guidance was to keep working out and be prepared for the start of the Boston rookie camp in September. He signed a two-year ELC with the Bruins last March, which starts this season (he finished the 2015-16 campaign on an ATO with Providence), and don’t be surprised if he makes a serious run for NHL playing time either right away or during the season. With his size, mobility, smarts and attitude- he’s an attractive option for Boston as a fill-in or in the 4/5/6 slots. Matt Benning was not invited to the camp per Providence Journal veteran correspondent Mark Divver, and that does not bode well for his future in the Bruins organization. Whether it was due to the 2012 draft’s sixth rounder stating his intent to seek better opportunities elsewhere (in order to pursue a similar path to that of Jimmy Vesey, Benning has to play out the entire 2016-17 NCAA season and wait until August 15 before he can sign with any team he chooses, unless the Bruins trade his rights and he comes to terms with that other team) or a decision made by the B’s is not confirmed at this time, but it appears that Benning may be the first casualty of the Bruins organization’s improved talent pool at the defense position. TSP had time for Benning; he was an underrated prospect with smarts, a physical game and NHL bloodlines, but it’s entirely possible that he saw the writing on the wall and wants to seek opportunities elsewhere. It’s also possible that this was a mutual understanding. It did not take long for Matt Grzelcyk to notice the talent. He had heard all about the young, gifted defenseman that was on his way to Boston University. So when Charlie McAvoy stepped onto the Agganis Arena ice last fall as a member of the Terriers, Grzelcyk was not surprised at the freshman’s immediate impact. Hockey is a physical game, and you have to expect to get knocked down once in a while. While it’s a rough-and-tumble sport, no one wants to think about the kind of injury that Jeremy Lauzon, a second-round draft pick by the Bruins in 2015, suffered on April 15. During the Quebec Major Junior Hockey League playoffs, the left shot defenseman felt something on the right side of his neck. At first, he thought it was just a relatively minor stick foul until he saw the ice turning red. While battling for the puck behind his net, Lauzon fell to the ice and an opponent’s skate blade lacerated his neck that could have had far graver consequences than the nasty scar that runs under his right ear. Charlie McAvoy has been lauded for the way he committed himself to his fitness once he arrived at Boston University last year. But the Long Island product is, and will probably always be, a little plump in the face and jowls. When it was suggested the 14th overall pick last month looked “a little fluffy,” Bruins assistant coach Jay Pandolfo did not agree. Danton Heinen says he’s doing “everything he can” to take that job in training camp. 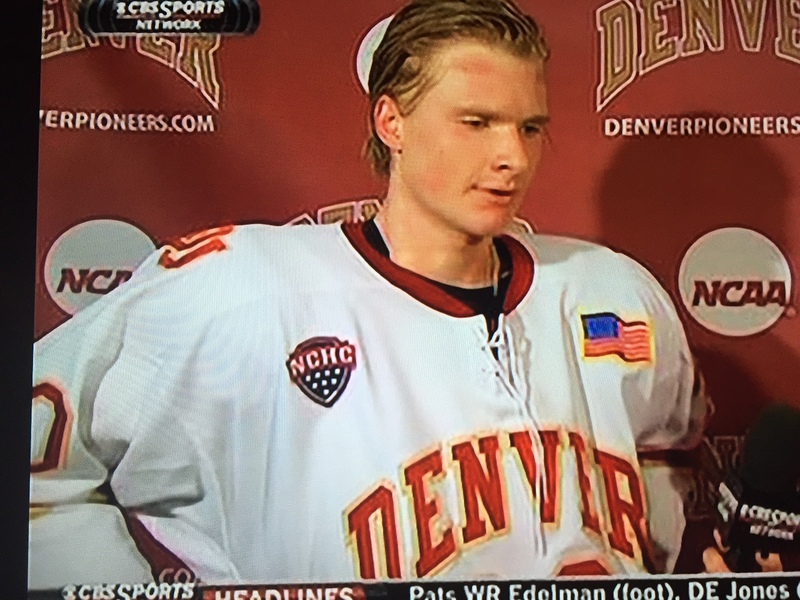 The Bruins got Heinen to go pro after his sophomore year at the University of Denver. The 6-foot-1, 190-ish-pound left shot forward was a fourth-round pick in the 2014 draft [worth noting: considering that draft also included Pastrnak and that the bar wasn’t exactly set high, it’s entirely possible that Peter Chiarelli’s final draft with the Bruins was his best outside of 2010], but since his selection has used strong play at the NCAA level to cement himself as a high-end scoring prospect. Typically, a player with (Trent) Frederic’s kind of game — he’s got “jam,” as they say — doesn’t go early in the draft, and they use the mindset that draft status doesn’t matter once you’re given an opportunity. Frederic is taking the same mentality despite his fortune of being made a surprise first-rounder. It was back when Malcolm Subban was first starting to speak again, his voice still raspy and ragged, that he thought he would make his plea. What better time, really? He would ask his parents, at the height of their sympathy for him, to allow him to get a car. A year ago, Danton Heinen came out of left field in the BCHL (and the fourth round of the NHL draft) to post one of the most productive seasons of any freshman NCAA player not named Jack Eichel. His 16 goals and 45 points in 40 games a year ago for Denver University highlighted his fine puck skills and fine vision/offensive hockey sense. He’s a good skater, though lacks a top gear that would make him even more of a consistent threat on every shift. The biggest knock on Heinen a year ago was his average size and though he’s still listed at 161 pounds on some rosters, in speaking to him and others in the Bruins organization, he’s north of 180 pounds now. He’s still got some growing and physical maturing to do, but don’t be fooled by the outdated 160-pound measurement. This season, it’s been tougher sledding for Heinen offensively. In 18 games, he has five goals and 11 points. Folks who just look at the stats line are starting to ask questions about that, so this is a quick post to provide some observations from several games I’ve seen from him on film. Interestingly enough, he had no points in either game, and even more intriguing- he was in my opinion, the best DU Pioneers player on the ice. I also recently interviewed Jay Pandolfo, Boston’s player development director, and he said the same thing- Heinen’s play has not been an issue at all, even if the pucks aren’t going in for him. In his most recent weekend series against Notre Dame (officially ties), the Pioneers carried the offensive play, outplaying and shooting the Fighting Irish by a wide margin in both games. Thanks to Notre Dame goalie (and Sabres prospect) Cal Peterson, DU scored just three goals on 95 shots in both games. Give Peterson credit, because anything less than the stellar performance he brought with him from South Bend, and the outcome would have been different. On Friday evening Heinen played extremely well, officially credited with five shots out of DU’s 50, but he also had multiple shot attempts- close to doubling that total in shots either blocked or ones that missed the net. Several of his shots on goal were of the high danger variety- Peterson made a great save to deny him on the power play and then another of Heinen’s shots squeaked through his pads but died on the goal line. The play went to review but was called a no goal. On one opportunity, he got behind the Notre Dame defense and broke in alone on Peterson, only to ring the puck off the post on the blocker side. Heinen’s line had 23 shots between them, so that unit was a going concern all night and only thanks to the Notre Dame netminder was the damage nearly negated (Moore scored on a flukey goal that hit Peterson’s mask, then pinballed into the net off his defenseman in front). It’s easy sometimes to get caught up in a player’s statistical success, and Heinen would probably be the first to express his disappointment that the offense isn’t happening for him the way it did a year ago, but the good news for the player is that he’s still working hard and creating scoring chances. Losses of upperclassmen like Joe Laleggia, Daniel Doremus, Ty Loney and Zac Larraza haven’t helped much, either. Heinen is currently skating on a line with junior Trevor Moore (who is an undrafted free agent and looked real good against Notre Dame) and freshman Dylan Gambrell (named NCHC freshman of the week), and they are DU’s most productive unit, with all three currently in the team’s top-4 for scoring. In the fast food mentality of modern sports fans, it is easy to look at Heinen’s lack of production and simply assume that he is playing poorly, but that is not the case. While there is a certain bottom line to everything in that Heinen is inviting criticism for not raising the scoring bar in his sophomore season, there are other factors in play. Denver as a team is collectively struggling to score and sometimes the blind luck of doing everything right on a play but still not having the puck go in for you play a part. Hovering around .500, the top scorer, Gambrell, has just 15 points in 18 games, so offense is at a premium. On a different club, and given the quality chances I’ve seen Heinen generating this year, it is a reasonable assertion that he would be faring better in that situation. This is often lost on the stat watchers who aren’t seeing many (if any) of the games and instead of seeking to find the right context, engage in the easy way out of assuming a player is not performing. In the eyes of Pandolfo and DU head coach Jim Montgomery, Heinen is doing the little things and as long as he keeps his high effort levels up, he’ll eventually be rewarded with production much like Matt Beleskey has in Boston. In the end, Heinen’s best attributes- his soft hands, his superior vision and three-zone game and work ethic are all prized assets for any pro. It might mean the B’s will want him to return to DU for one more season in lieu of signing this spring, but the down numbers are not a major cause for alarm. When the Boston Bruins drafted Surrey Eagles captain Danton Heinen out of the BCHL in the fourth round of the 2014 NHL Entry Draft, there was a collective shrug that started in the Wells Fargo Center in Philadelphia and radiated outwards as those following and analyzing the draft sought information on the first real mystery player of that lottery. He wasn’t anywhere to be found on the NHL’s Central Scouting lists. Nor did he appear in any of the independent lists out there to include my own Red Line Report. A 1995-born player, he had been previously passed over in 2013 and he wasn’t on any of those lists, either. As information began to trickle out, an intriguing picture of a late-blooming skill forward emerged, but it was not until he took the NCHC by storm last year that the real interest not only by fans but some of the NHL’s clubs that completely missed out on Heinen reached a crescendo. I’m going to do the basic forensics to build a case on this rising star and scoring winger who is someone I see already near the top of Boston’s prospects depth chart with a high ceiling at the next level. Don’t sleep too long…the Heinen train is leaving the station and seats are filling up fast! To take such an unknown at 116th overall- in the final five selections of the fourth round, a player not anywhere on the pre-draft rankings, appeared to be a stretch. I was high on Soo Greyhounds forward Michael Bunting, who went one pick later to Arizona and the Rangers got value in Russian goalie Igor Shestyorkin one selection after that. Some of the guys I was projecting for Boston there a year ago who all went in the 5th round: skilled Massachusetts forwards Max Willman (Sabres) and Tyler Bird (Blue Jackets)…gritty energy guys like C.J. Franklin (Jets) or Shayne Gersich (Caps) or rugged WHL d-man Dysin Mayo (Coyotes) were all players I followed during the season and felt made sense at that spot. Gathering evidence: The information soon began to trickle out on the Langley, BC native. “He hadn’t refreshed the page in a few minutes so didn’t realize he had been drafted until his adviser called him with the news. Heinen wasn’t on the final NHL draft rankings list both he and his adviser had fielded some questions from a few teams. Some unsubstantiated rumors began floating that one of those teams the Bruins might have scooped was their hated rival up north- the Montreal Canadiens. Heinen did not attend the 2014 Boston Bruins development camp because the CBA did not permit him to miss pre-enrolled classes for the sake of attending an NHL team-sponsored event, so there was little to no firsthand knowledge of him until the 2014-15 NCAA campaign began that fall. He wasted little time in establishing himself as an impact player right away, averaging a point per game for the DU Pioneers from start to finish. As the season went on, scouts who were concerned about his slight 6-foot frame (and though he’s listed at 165 pounds, Heinen himself insists he’s now closer to 180) and a wearing down effect put those issues aside. Heinen actually got *better* late in the year as his confidence seemed to blossom and he continued making plays all over the ice for his club to the tune of 45 points in 40 games, helping them reach the NCAA tournament quarterfinals. Preferring charges: Heinen did not take a step back in Wilmington this past July when he suited up for his first B’s prospect camp. His mature game and slick playmaking skills were immediately evident to those in attendance and those of us who caught a bit of it online. “I don’t know if we were surprised, but when you see that, you open your eyes,” Bruins development coach Jay Pandolfo said. “You think maybe he’s closer than further away for sure. He had a great year last year. Pandolfo praised Heinen’s poise with the puck, release and shot, and singled him out among the large group of prospects in the camp for making things look easy. But Pandolfo also said Heinen needs to get stronger and a little bigger. The Bruins got Heinen because they did their homework where some other NHL teams did not. They used their team methodology of getting multiple looks from different sets of eyes, and so if you’re out looking for one single scout to take credit for his discovery, you’ll be disappointed. Based on who is out where, you can surmise that Dean Malkoc had a major play in it and you wouldn’t be wrong, but he was the first to tell me when I texted him last year after one of Heinen’s many strong games to congratulate him that he was not the only one responsible. “Team effort” has, is and will be the mantra when it comes to the team finding talent that pans out. Same goes for those players who don’t meet expectations as well. The indictment: Heinen has played a little center, but has mostly played split out to the left in his time at Denver University. He can play the off-wing if needed and the scouting report on him is encouraging: highly creative with superb vision and offensive instincts; slick, smooth hands and a quick stick to thread the needle or fire off accurate wristers coming down on the rush; not a blazing skater in open ice, but quick in his short-area burst and uses lateral agility to shake defenders in tight spaces; average size and strength; top-six NHL forward potential. Yes, your honor- it appears that the Boston Bruins are guilty of draft day theft. How much of a sentence they receive will depend on Heinen’s continued development and how he turns out, but the initial returns are highly encouraging.